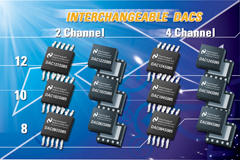 National Semiconductor Corporation expanded its portfolio of digital-to-analog converters (DACs) with the introduction of six new, ultra-low-power, 2- and 4-channel DACs in 8-, 10- and 12-bit resolutions. The DACs are offered in a tiny 3 mm by 3 mm LLP® package as well as an MSOP package. Each DAC consumes very little power and has typical settling times of 3 usec to 6 usec over a supply range of 2.7 V to 5.5 V. For example, the DAC122S085, a 12-bit, 2-channel DAC, consumes less than 1.5 mW (maximum) at 3.6 V in normal operation and less than 0.2 uW (typically) in power-down mode. This low power consumption makes these DACs well-suited for portable, battery-powered applications in industrial, medical and consumer markets. National’s DACs and ADCs allow designers to develop a single standard PC board layout that can support multiple devices for seamless upgradeability. Over the past two years, National has released more than 50 ADCs and DACs. The new DACs are interchangeable, providing customers with a wide selection of resolution and channel options for a broad range of applications. The DAC124S085, a 12-bit, 4-channel DAC, has a typical integral nonlinearity (INL) of less than +/- 2.3 least significant bits (LSB) and a typical differential nonlinearity (DNL) of less than +/- 0.15 LSB. Each DAC has a rail-to-rail output swing, uses an external reference and operates over a temperature range of -40 degrees C to 105 degrees C. In addition, each DAC can accept input clock rates up to 30 MHz over the entire supply range of 2.7V to 5.5V. Prices start at $1.20 for the DAC082S085 in 1,000-unit quantities. The MSOP products are available now and the DACs in LLP packaging will be released this summer.